Join us at the Visitor Centre to meet the artist of our beautiful new painting ‘Bears Lodge – Makwa Endaad’ by artist John Williams. Refreshments will be available. 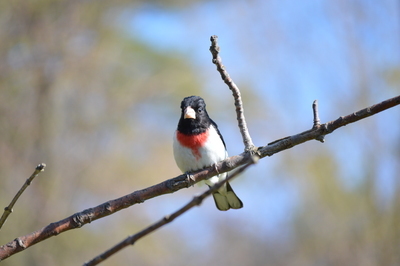 Looking forward to another exciting birding season! The activity schedule for May is attached below. conducting a deer harvest in Rondeau Provincial Park. times and within the boundary of the park. The harvesters will use scoped rifles during the harvest.  Buffer areas and safety zones to ensure a safe harvest.  All harvesters will be stationary and well away from the park boundary. not be allowed throughout the harvest.  Park staff will be available on site at all times during the harvest. deer will be used by the First Nation community members. that you comply with all posted notices. Assistant Park Superintendent at (519) 674-1759. Please see the attached document outlining the phragmites control implementation plan at Rondeau Provincial Park. 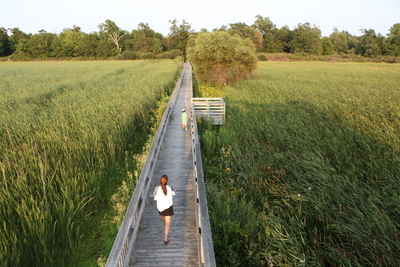 Are you interested in exploring Rondeau and participating in a race that takes you to all corners of this cuspate sandspit!?! Start times are every 30 minutes between 10am-2pm, on a first come first serve basis. 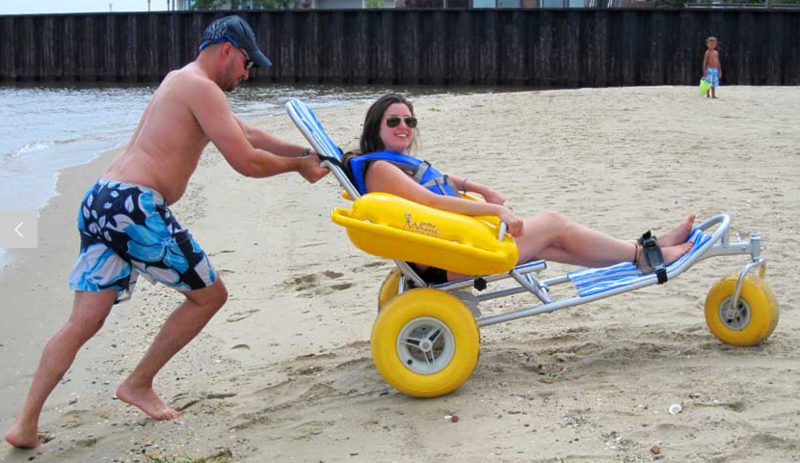 The WaterWheels® beach wheelchair is now available to use at Rondeau Provincial Park! This is a specially designed lounge chair with floatable armrests and tires, making it the perfect accessible wheelchair for the beach and the water. The floating beach wheelchair is located at the Park Store and it is FREE to use for the day. It can hold a maximum of 300 lbs (136 kgs) and is equipped with a seatbelt, 3 different seat adjustments, and waterproof back pocket. Wade Watts, founder of Wheelchair Friendly Solutions Inc., is pictured below featuring the beach wheelchair. His vision is to create an accessible world for all. 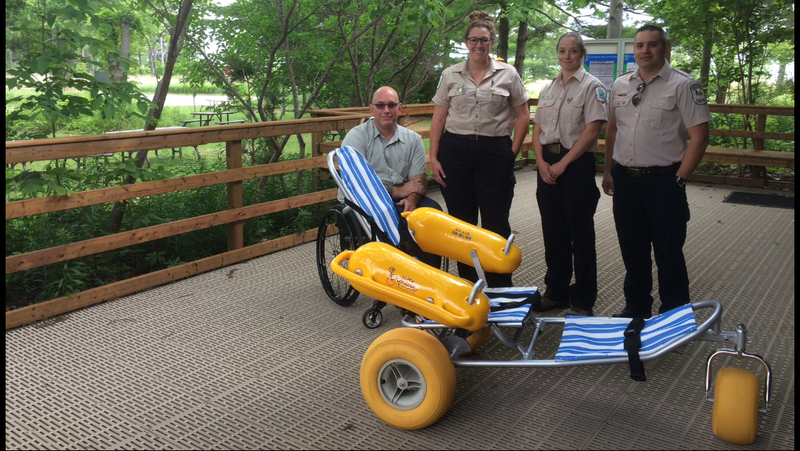 He has collaborated with Ontario Parks to help spread his vision and we are very excited to share our new accessible beach wheelchair with Rondeau park visitors. Please visit or call the Park Store (519-674-1757) to rent or to inquire about this impressive floating wheelchair. Do you want to get outside and partake in a fun and healthy activity with a new group of friends? 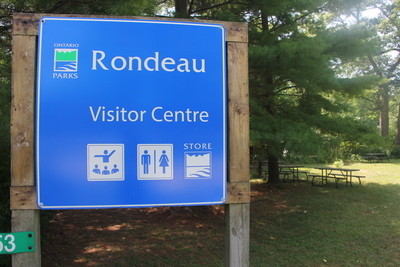 Rondeau Park is participating in the 30×30 nature challenge! 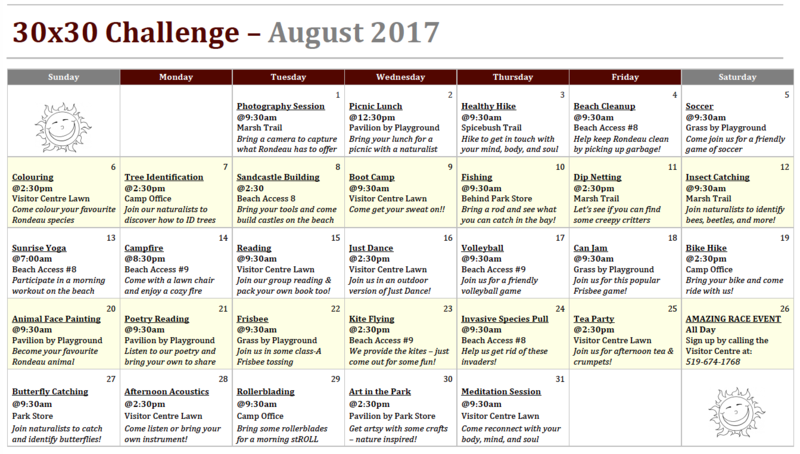 We are running a fun 30 minute outdoor activity each day for the entire month of August. We encourage everyone to join us in this daily dose of nature.